Textile Trails refers both to the geographical trails I love to follow as I explore the textile traditions that fascinate me, as well as the research trails I enjoy using to find out more about textiles I have purchased, where and how they are produced, and necessary travel logistics. 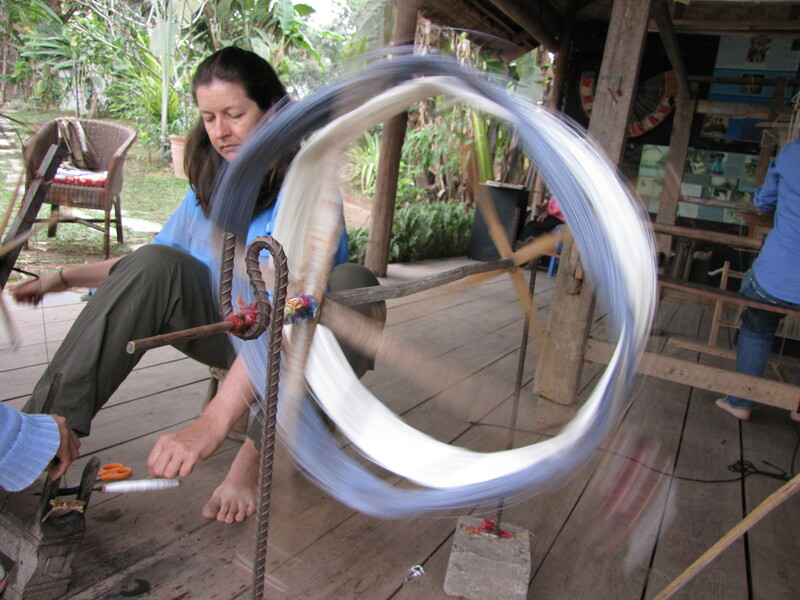 My textile trails journey began with three fabric purchases in Thailand in 2001. At the time I assumed they were Thai, but I love my local library and bookshops, and stumbled upon a book with a photo of Hmong indigo batik, and recognized one of the pieces I had bought. I had to know more. Over the years, I scoured bibliographies and the internet, following one lead after another to find out more about the pieces I had bought, which turned out to be Hmong batik, Chinese stitch-resist (zha-ran) and Cambodian ikat (hol). At the same time, I sought out textile traditions in every country that I had the opportunity to visit. It was like being on a treasure hunt. I bought fabric in Lhasa that I had seen in bags sold in Kathmandu, then discovered at an exhibition in Delhi that the patterns were similar to those in Bhutanese weaving. Years later, imagine my delight at watching weavers in Bhutan create those same patterns and explain to me the names of the motifs. 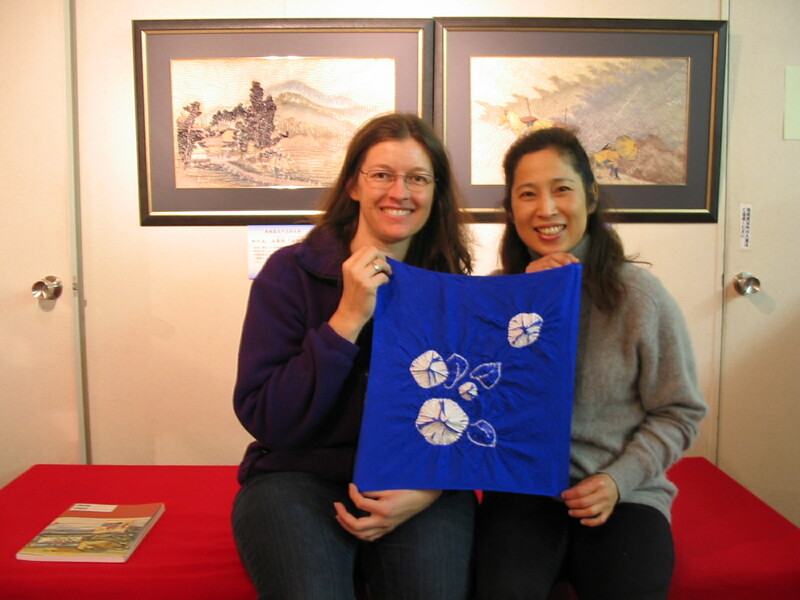 I experimented with shibori, and when I passed through Japan, I took the opportunity to be tutored in ori-nui and maki-age shibori in Kyoto, and also visited Arimatsu. On another trip, I took a local bus to Zoucheng, Yunnan, armed with a piece of paper with a photo of my original zha-ran purchase and had a friendly hotelier write in Mandarin that I would like to learn how to make the butterfly pattern, then found someone to teach me. 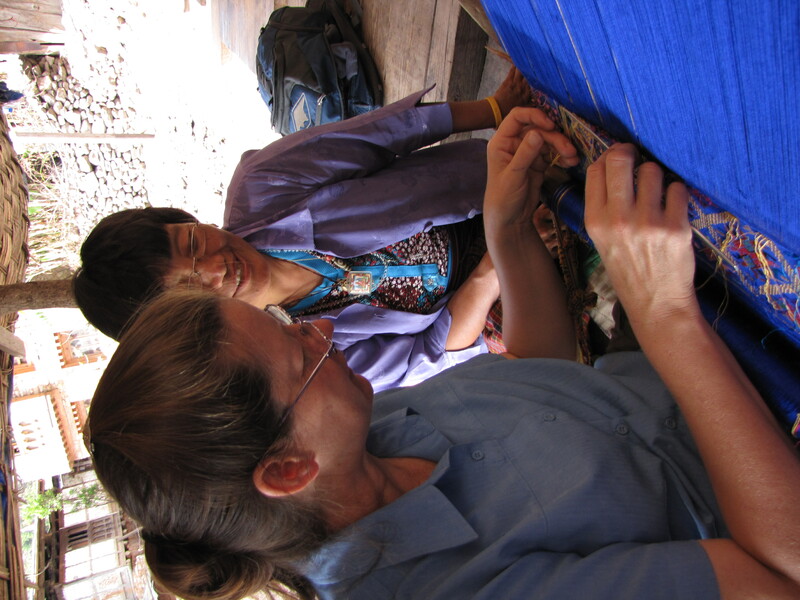 I have learned mat-mii in Laos, and in Vietnam and Laos have undertaken long rides on local buses and on the back of motos or trekked to reach villages producing outstanding weaving or where traditional dress is still proudly worn. Everywhere I travel, I find myself drawn to the locals who are dyeing, weaving and stitching. I find that my interest in textiles gives my travels focus. I enjoy researching the origin of pieces I have bought, and when I eventually discover where they were produced, I make plans to go there to see production for myself. Often I find opportunities to learn these techniques, and crossing the language barrier to interact with local artisans has brought me many of my most rewarding travel experiences. Nana had a beautiful floor loom and I was fascinated, always begging to be allowed to use it. She did teach me the basics, and left her loom to me when she died. Unfortunately I was too busy with my music studies to use it and ended up selling it to buy a flute for university. 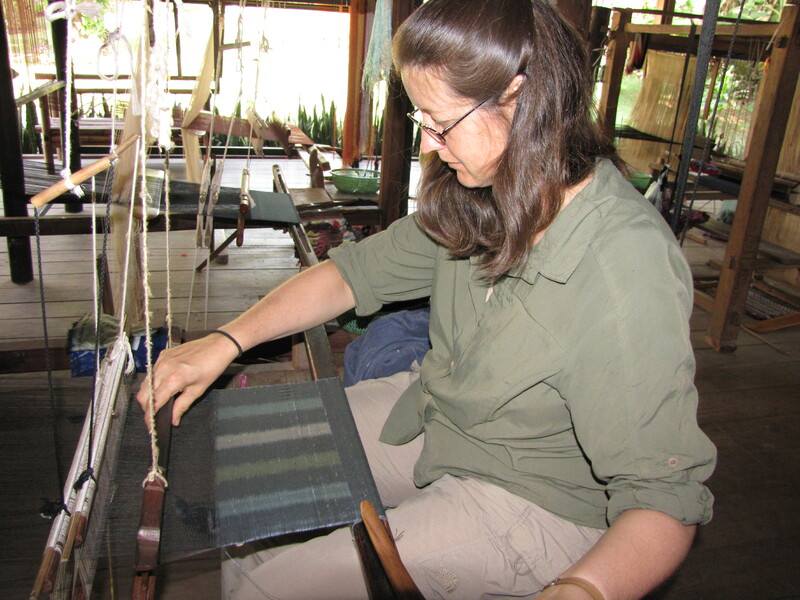 But I have retained my interest in weaving and other aspects of textile production, and find that when I travel I am strongly drawn to local weaving and dyeing activities. In 2011, I found myself in Bhutan, learning the intricacies of weaving kushutara in exchange for teaching music to Bhutanese children. It was wonderful to at last understand what I could not find described in books, and so I began this website to share what I was taught in Bhutan, as well as the other gorgeous textiles I am finding. It is a story of women who feel in love with a piece of art and always wanted to find more about it. It is the story of Wendy Garrity from Perth, Australia, who saw photos of Kishutara before she arrived in Bhutan and found it beautiful. Her passion for the Kishutara grew. She got the opportunity to come to the land from where the textile originated in February, 2011 to teach music; flute and related instruments, as a volunteer in Kilu Bhutan Music School. Her immediate pursuit was to learn weaving and she availed the chance in “Kesang weaving centre” where she was welcomed by the proprietor to learn at any dan and time. She began her lessons in April. Azim and another weaver, Phuntsho Choden, were the main ones who taught her, but others always helped whenever it was required. 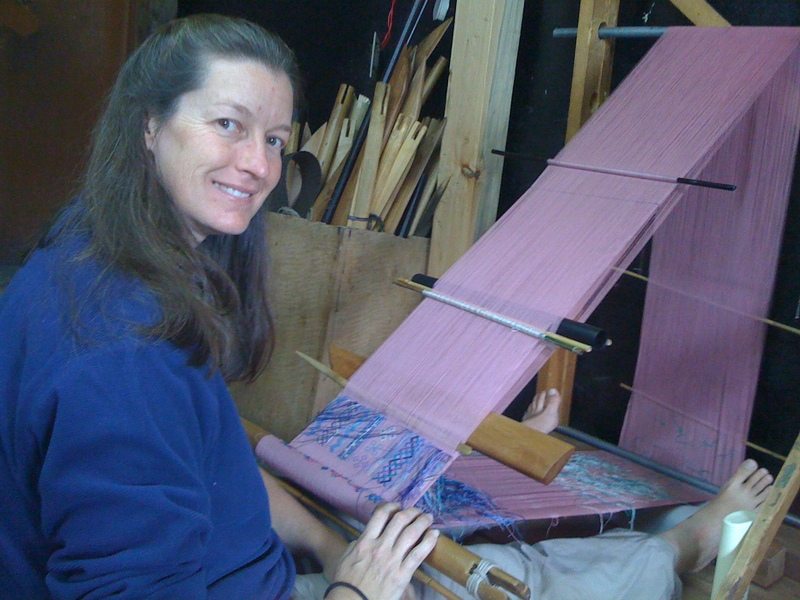 Wendy’s first product was a plain piece, which was an exercise to make her learn to use a back-strap loom, since all the looms she had used before were table looms or floor looms. The weavers really stepped outside their comfort zones and made efforts to communicate. In early May this year she had the opportunity to travel to Central and Eastern Bhutan where the different weaving traditions are strong. A highlight of that trip was spending five days in Khoma and Goenpaka, where she met and watched many weavers and even had some time to weave a few rows on a kira during which time she had help nearby guiding her. She returned to Thimphu with a camera full of patterns she wanted to try and had Phuntsho very patiently show her what she wanted to learn, and started a tray cloth with patterns all over it. Wendy says that when she weaves she feels at peace and relaxes in the rhythm of the work; with her thoughts so focussed on the patterns, she becomes absorbed. “Nana had a huge floor loom with 8 pedals operating 8 heddles, and I was fascinated,” she said. She said she would stay at her nana’s house for a weekend and learn by setting the loom up with her leftover threads and weave all weekend. Unfortunately her Nana passed away when she was about 15 years old, leaving the loom to her. She nevertheless finished the work that was still mounted on the loom and was part way through. By then, she started her university music studies and was time to buy a higher quality flute that would have been difficult for her. But her mother pointed out that she was not likely to find time to use the loom soon, and Nana had really loved her flute playing; surely she would be happy for her to sell her loom and use the money to buy a good flute. Over the years, she was busy with her life taking care of her children and found only a very little time to weave. As her children became more independent she found a little more time to experiment with the techniques she had seen. Wendy also teaches general music at Druk School from PrePrimary till Class III.